This is our second article in a series of articles on Exploring Ooty. To read our first article about Pykara Falls , CLICK HERE. After the amazing experience at the Pykara Falls, we stayed overnight in Ooty. We decided to visit Coonoor the next day, a small hill-station town nearby Ooty famous for Nilgiri Tea. 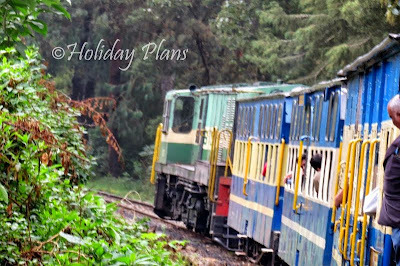 It is situated on a “toy-train” line between Mettupalayam(28 km) and Ooty . 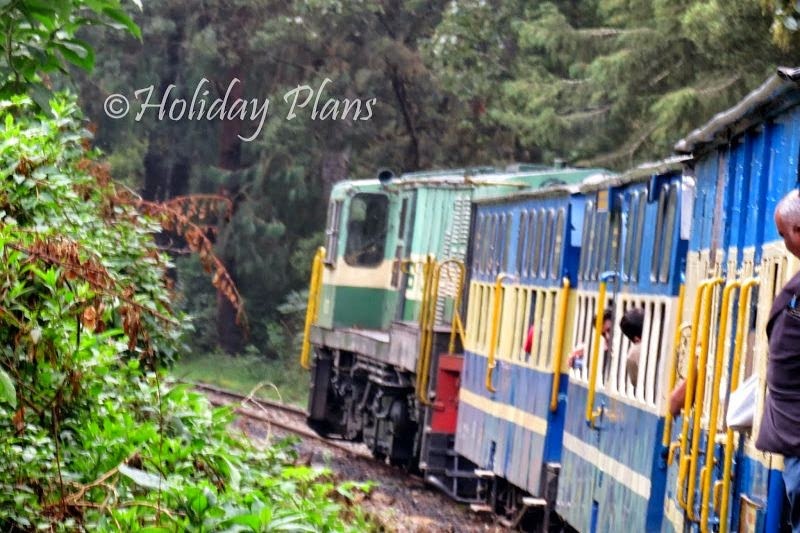 This toy-train comes under Nilgiri Mountain Railway(NMR) and included as a world heritage train by UNESCO. Travelling in toy train is something which I had fantasized since childhood; thereby prompting me to book the tickets many days before the day of visit, resulting in me getting a window seat! And finally having got the opportunity to experience it , I was very excited. In morning we reached the Ooty (also known as Udagamandalam) station. Ooty railway station is very small but I think that is what one can expect from mountain railways. Located in the heart of city, it has a government owned canteen which serves meal on buffet basis just before the departure of any train. It reminded me of my days in hostel mess. The food does not offer many options as one has to make a choice among Idli, vada, sambhar or poha (or at max rice dal). The very prospect of travelling in the toy train brought churns in my stomach out of excitement; this and it being my 23rd birthday only made the things better! The train seats were just like bus seats in the movie “Bombay to Goa” ( the older one) .The sound of the bellowing engine was materializing the childhood memories of the poem “chuk chuk gaadi”! There are in total of 16 tunnels on the route. Few of them were leaking water because of the rain that poured earlier the same morning. The major attraction apart from the ride was KETTI VALLEY – the second largest valley in the world ; the very sight of which flabbergasted me completely! Ketti is a small town in Nilgiris district and located en route to Coonoor. Ketti station is the 3rd station and lies exactly midway between Ooty and Coonoor and the valley lies just ahead of the station. After the train left Ketti station , I was completely spell bounded by the view I was offered by this majestic valley. Gorgeous views of tea plantations; the small hills and lush green field added up to the beauty. Wish one could capture that moment and relive it again and again! Ketti valley is a heaven for nature lovers and photographers. No surprise it is one of the most visited tourist site in Ooty; also known as “Switzerland of Nilgiris”. Well, Martin Buber once said ,“All journeys have secret destinations of which the traveler is unaware ” and ,indeed, we were revealed with our “secret” destination after viewing the Ketti valley. But then what Pykara and Ketti had offered me made me even more curious to see what lies ahead of me. Excellently written,keen to visit there!!! I remember how at last minute i got 2 tickets for this beautiful journey on this Toy Train. This is indeed a heritage train. Me and wife had the window seats- and to us their was an entirely different and magnificent world outside the window. Ketti valley , the second largest gorge around the globe, which is famous for its immense natural beauty completes the journey from Ooty to Conoor. For me the best part of the journey was when the train passes through the tunnel, and the driver switches off the lights in the train! I have been to Ooty but by road and after reading this article I am sure to have missed something beautiful. If ever I get a chance to visit again, I will definitely use the toy train. Moreover, it's always great to read your account for the place I have visited. Shubhopriyo- Yes bro you should definitely try the toy train this time! It's amazing!